We are constantly being told to keep our emotions at bay, with insipid phrases quipping at us, we are conditioned to believe that feelings are the enemy. If you cry, you are weak. If you admit that you’re unhappy, you’re attention seeking. If you do anything remotely “sensitive,” you are condemned. This ideology is wrong: There is no harm in talking about how you are feeling and there is no shame in admitting that you have ebbs of sorrow flowing through you. We should be open, hearts and minds, and we should communicate to everyone. That’s the subject of harrowing but completely compelling documentary The Work. Directed by Jairus McLeary and Gethin Aldous, The Work revolves around Folsom Prison. 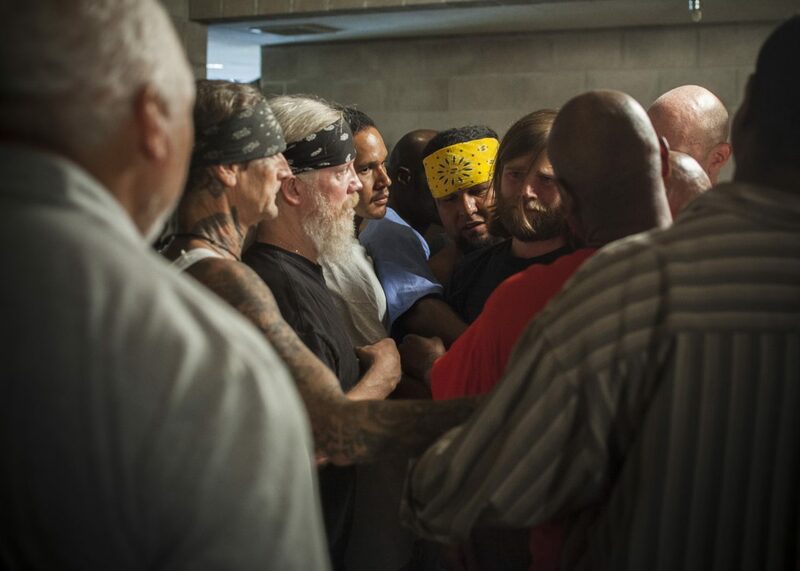 Set across a four-day group retreat, outside participants enter a therapy session with level-four convicts (level-convicts have the highest security.) Each man in the room takes turn at delving into his past and connects with each other. In an expression of truthfulness and emotion, The Work looks at tackling rehabilitation through openness. Within minutes of The Work, there is a palpable and charged energy that keeps you enthralled. Here, men from different walks of life battle demons as one; working through their stories with a raw intensity and a rare honesty. By every background, I don’t just mean the men who are convicted but also those who come in to the circle from the outside. Bartenders and teachers deal with members of cults and gangs and yet they all treat one another with compassion – like a family of brothers and sisters trying to cope with the agony of life. It is glorious to watch people express themselves and work through all kinds of awful issues. Co-directors Jairus McLeary and Gethin Aldous shoot the film with an air of care. Though the subjects within the therapy session have given hearty permission for the film, there is still an attentiveness to still make the documentary part of their safe space. This isn’t nosy filmmakers looking for their greatest story; the filmmakers have given up their time and have worked with the community here for some time. It is not exploitative film-making, it is trying to get this message and sentiment out there, in order to heal what is broken inside. Those behind the camera truly believe that and it comes across extremely well. Since shooting, the work of the Inside Circle Foundation and the participants of the film have gone on to spread this ideology across the globe. Interacting with prisons, schools, work-places and even home, the guys behind The Work have inspired countless amounts of people to be truthful with their pain, grief, and emotions. It is honestly astonishing to see what this level of communication does for people. The minute we take down our social barriers, we are all the same in the mud of life and we should work together in order to help one another. It is with this message that The Work truly flourishes.